The School of Musical and Auditory Sensitivity arose out of my experience and understanding that musicality is the basis of all our musical experiences. Musicality is all-inclusive and goes far beyond the notion of music. It has much more to do with sensitivity and receptivity – it is a quality of life. To see life as musical simply means to recognize its fluidity and its constantly changing essence. Colours, movements, sounds, feelings are all experiences and facets of our lives that have a musical dimension. Your joy and fun in music grows with the depth of your listening sensitivity. You can be a child, an adult, or an accomplished musician wanting to learn a new instrument or play your old instrument differently. The sound of a Tibetan singing bowl, for instance, can be such a wonderful experience to someone open and ready to listen, that this experience can create the wish to play an instrument. Unfortunately, the way music is usually taught – particularly classical music – very often has the effect that the students, although becoming technically proficient, lose their joy and fun in music. My aim is to remind them of their ability to listen – and through reconnecting with their musical sensitivity they can easily rediscover their joy and fulfilment in music. Needless to say there will be a lot of improvisation in my classes! The purely musical experience – listening – has to be, and has to remain, the central pillar in music, starting from the first steps. With me, you don’t have to learn the technique first so that one day you will be able to play or sing music. We start immediately. To learn a new instrument is similar to starting a new relationship. It is an intimate and delicate affair. The technique should evolve and crystallize organically while listening and allowing the hands and body to explore the instrument freely. It is my understanding that the love for an instrument and its particular sound gives birth to its own learning dynamics and that any instrument can be learned and enjoyed at any age. To what extent one will be able to play according to an ideal or style is another question. Yes, some instruments are more demanding than others and each individual situation is different – like in human relationships. Traditionally trained musicians can learn how to change their priorities from performing into listening. In this they rediscover the freshness of a musical experience. I can teach musicality on any instrument you play, but I can also be helpful technically with the following instruments: voice, guitar, bass, recorders (soprano, alt, tenor, sopranino), percussion (hand percussions and drums), cello, dilruba, tamboura, Tibetan singing bowls, American native flutes, Japanese shakuhatchi and kyotaku, ocarina, Mexican kena flute, didjeridoo. 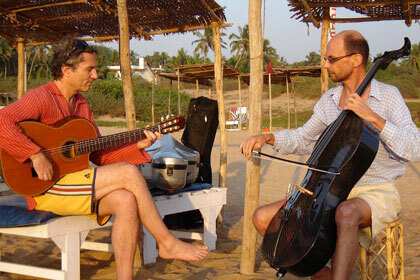 The most difficult ones to learn are: cello, Japanese flutes and Indian instruments like the dilruba. Teaching beginners and advanced musicians does not make much difference: in listening we are all equal. During the first lesson we define, together, your needs and your interests. Some may want to become more intimate with an instrument they know already; others may have an interest in another instrument or the voice. On the other hand, many simply feel a pull towards music and do not have a clear notion of how to approach and integrate music into their lives. In this case I propose an introductory lesson of one and a half hours where we experiment with different instruments, including the voice (which I consider the most intimate instrument), and we explore natural tendencies and preferences. Many instruments are very simple to learn and don’t need a regular discipline. To integrate music and listening into our lives does not mean that we need to spend a lot of time learning a specific technique. My goal is to inspire and to help you become self-sufficient. In the beginning our meetings will be more regular. This will allow us to create the space for mutual understanding, to learn how to hold the instrument and for me to teach some of the basic principles. One of my principles is learning to remain relaxed while being focused at the same time. This is crucial because the base we want to create for our musical experience is one rooted in joy, lightness, ‘at ease-ness’ and freedom – not in effort, ambition and judgement. I give a lot of importance to improvisation. Out of improvisation, composition grows as a natural gift. I also teach musical theory but mainly in the context of improvisation. There are a couple of musical principles, such as the basic understanding of chords and scales and the mystery of intervals, which are very helpful to be understood at a certain level, especially when musicality is expressed or shared with other musicians. On the other hand, I rarely use written music or melodic notation. I see it as a hindrance for many a student – as it was to me in my early years. (To really profit from musical notation one’s brain would need to have the ability to easily transform visual signals into auditory expressions – which is a rare talent.) Most of the time it happens that the effort of reading complex notations (as we do in classical music) leaves little space for listening and being aware of the music itself. I place an emphasis on musical sensitivity and listening right from the beginning. When these elements are well integrated and their importance clearly understood and experienced, notation and other technical tools can easily be added. Once you are at ease with your instrument or voice, you will simply come back when you need more inspiration or a new direction. Welcome to your first lesson! Listening, singing and playing music are such wonderful ways of participating in the celebration of this existence!